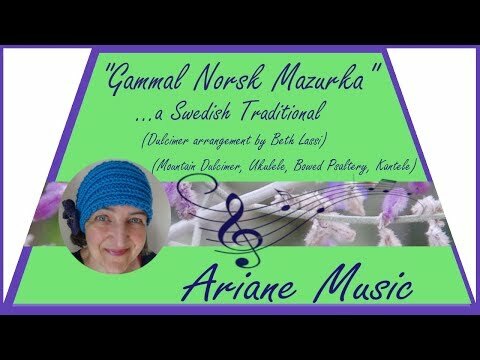 I recorded "Gammal Norsk Mazurka" (a Swedish Traditional) on the basis of the arrangement of Beth Lassi from hers and Nina Zanetti's beautiful book "Tunes for Two or More", Volume 3. I added different patterns of the harmony accompaniment. Vielen Dank, lieber Martin, für Dein Kompliment. Thank you very much, Val, for your kind comment. Very nice Ariane.You are a wizard with technology. It's such a treat to watch you play, Ariane. Beautiful! Aw....that is so kind of you, my dear friend Terry. Thank you very much - I am smiling from one side to the other. Thank you very much, Gordon, for your kind comment. I am very happy that you like it. You are so very amazing. I don't write that haphazardly. It's really true. I always enjoy your music, and this one is no exception. Many smiles to you, Ariane.. Thank you Ariane. I really enjoy listening to Swedish folk music and you do such a beautiful job of playing it. The kantele is a Finish traditional instrument - and since Finland is also a Scandinavian country I thought it would fit perfectly to this Swedish Traditional. Great arrangement and well played. I love seeing all the instruments. Thanks for posting. Thank you very much, Steven - for your kind compliment! Catchy little tune, Ariane! Love the way you incorporated all those instruments!